New Venue | New Co-Sponsors | Great Success! 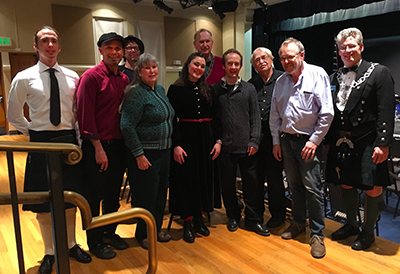 We’re very happy to report that the new ‘WinterDance’ concert venue, Hoover Middle School Historic Theatre in the Rose Garden district of San Jose, and the 13th annual Molly’s Revenge show with a new guest singer, Amelia Hogan, and local Irish step dancers, was a hit! The show was a complete sell out several days before the event, and there were extremely few no-shows. In fact, there were so few no-shows, and a waiting list besides the 205 tickets sold, that volunteers mostly ended up standing to watch the show. There were three new co-sponsors this year, all well-established membership non-profit organizations who have a long reputation for community service and philanthropy: the Saint Andrews Society of SF: http://saintandrewssocietysf.org (one of the oldest philanthropic organizations in California, who, among other things distributes scholarship funds and has two scholarship students at San Jose State University, one of whom was a volunteer helping out with the raffle and ushering at this event, and brought two more students with him to help out), the Santa Clara Valley Fiddlers Association: https://www.fiddlers.org (provides session and performance venue, teaching, and has a youth program to encourage and promote heritage music: Scots, Irish, ‘old-time’ and ‘bluegrass,’ and ‘traditional/classic country’), and the South Bay Scottish Society: http://southbayscots.org (which has among other things, an annual Toys for Tots drive and dinner in December). Saint Andrews Society of SF outgoing President, David Campbell, was co-master of ceremonies along with AmeriCeltic’s co-founder, Tony Becker. David Campbell, was dressed in full Scottish traditional attire, including his formal chain of office, providing many of the house with fine photo opportunities. A complete list of donors to the raffle and their donations can be found here: www.americeltic.net/winterdance#raffle. Kyle Currie, one of the SJSU scholarship awardees of the St. Andrew’s Society scholarships of 2018 volunteered to help with ushering and raffle management and brought two additional student volunteers with him. One of the two additional SJSU volunteers was Ariadna Manzo, the President of the SJSU Student Union. The event was at the Hoover Middle School Historic Theatre, seating capacity 205, on Park Avenue, across from the Rosicrucian Egyptian Museum, which was one of the donors for the raffle (they donated 4 adult passes as one of the 17 prizes). It was Friday, December 14, at 7:00 p.m.’which presented unexpected traffic problems for staff/volunteers, since less than a mile away Michelle Obama was at the Arena, greatly adding to the usual Friday night traffic. As readers may know from a couple of Mercury News articles, Trinity (Episcopal) Cathedral decided this year to use their venue entirely for themselves, as they need to completely rebuild their pipe organ and have some additional long-delayed maintenance and upgrades to do amounting to $350,000 or so. When the new board elected in the last two years saw that a music event such as AmeriCeltic and then co-sponsor San Jose Dublin Sister City Program could fill their Church, they realized they could–and should–use their own venue much more profitably for themselves. The local business community was very supportive of the event and the raffle for relief for fire victims: among the 17 raffle prizes/gifts were gift cards for Scrambl’z on The Alameda (now open for dinners), the Britannia Arms on Almaden Expressway, and a beautiful wooden box with 2, 1.5 liter premium wines from J. Lohr, tickets for several upcoming shows including the ‘Frankie Gavin’ performance at Bill Cope’s ‘Cope-a-Cabana,’ ‘Abbamania’ at the Flint Center, and ‘Wake the Dead’ at ‘the Barn’ in Gilroy, a ‘show of your choice’ at Art Boutiki, and several donations of gift bottles and baskets of fine whiskeys including O’Flaherty’s Pub, the St. Andrew’s Society, and a spectacular basket including Tullamore D.E.W., fine cigars, decorated lowball and shot glasses and arm patches from the San Jose Police Emerald Shamrock Pipe Band Society. The grand prize was 4, prime seating $60 tickets to the Kerry Irish Productions, ‘Irish Christmas’ (as featured on PBS in the past) at the Mountain View CPA, with 5 CD’s, VIP treatment including meet-and-greet with the performers who include two leading dancers from River Dance, and the world’s best award winning male Irish dancer, Tyler Schwartz. Some great selfies ought to be coming out of that one. Additionally a number of ‘BOGO’ coupons for dinners at the Duke of Edinburgh, Britannia Arms and Scrambl’z were handed out to attendees of the concert’free. Artisan Celtic Candies and Baked Goods, of Pearl Avenue, at Branham, in San Jose, provided a prize, and some refreshments for the volunteers. 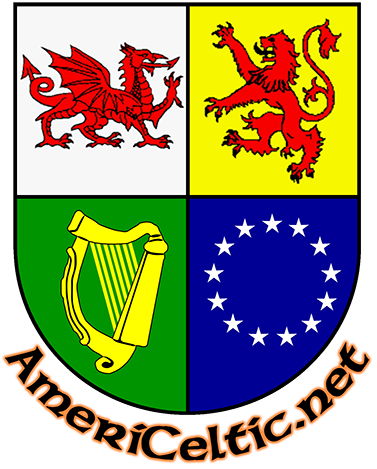 With many Americans of Scots and Irish descent, along with many others, in support of the concert and raffle, this annual event was an entire community gathering for a good cause and some fun, something very nice to see in this divided country. Because of the increased costs of a facility, ticket prices were raised about 15% but this allowed the performers to receive a bit more this year, and all the non-profit co-sponsors are receiving approximately $240 each toward their organizations, and had a great opportunity for more visibility and to promote themselves and attract more members. The raffle raised $1009 for Camp Fire relief and all proceeds of raffle were sent to the North Valley Community Foundation, a long-established 501(c)3 organization) . We only wish it could have been more, but we know many people at this concert have already given several times in the past few years to fire relief in northern California in a variety of ways. Last year, AmeriCeltic helped promote events in San Francisco and Marin County that raised over $5,000 for the Sonoma and Napa county fire victims. Individuals and organizations, including ourselves, in earlier years have donated to individuals and organizations for the Lake County fires and Redding area fire. There have been three back-to-back years, sometimes twice a year, of fundraisers, donations, raffles, etc for wildfire victims relief, alone. We will continue to support disaster relief efforts from the Celtic American community all over Northern and Central California as much as possible, but like everyone else, we hope and pray for a disaster free, more prosperous, happier, 2019.